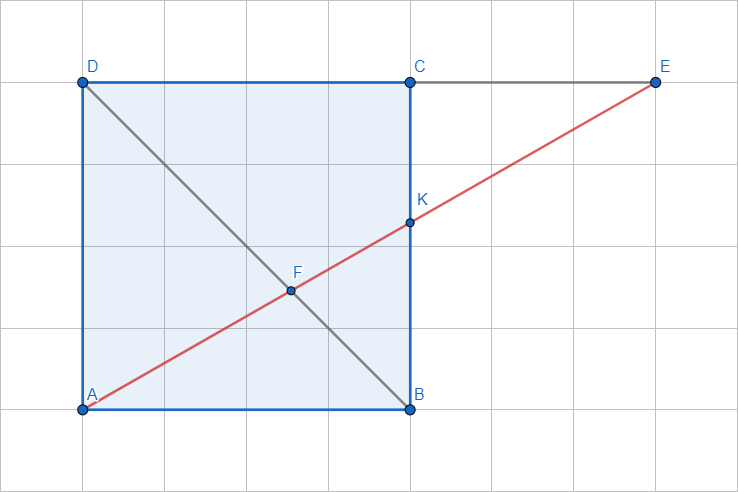 Where does this property involving quadrilaterals come from? Can you show me where does this property come from in simple terms? $\triangle AFD$ is similar to$\triangle KFB$ so $|AF|/|KF|=|FD|/|FB|$. $\triangle AFB$ is similar to$\triangle EFD$ so $|EF|/|AF|=|FD|/|FB|$. So $|EF|/|AF|=|AF|/|KF|$ proving the claim. You don't need a square. All you need is a parallelogram, the parallel sides enable the angle congruence that make the relevant triangles similar. Not the answer you're looking for? Browse other questions tagged geometry quadrilateral or ask your own question. How to prove the quadrilateral formed by bisectors of a parallelogram is not always square? Is it possible to prove a quadrilateral a parallelogram with two consecutive and two opposite congruent sides? Where does the gap come from? Where Does This Tangential Projection Operator Come From? Beautiful cyclic quadrilateral property involving isogonal conjugates. Where does this garbage line come from?